Over the summer and during school breaks, many families take vacations that involve long car rides. When I was growing up, my parents made sure that we weren't plugged into video games on car rides and keeping up with our education. Summer and breaks were not only time for fun, but they also wanted to make sure our skills were kept up over the summer, especially on the way to our cottage, vacation, the beach, and while running errands. To learn what great ideas I learned from my parents to keep up your children's skills over the summer/school breaks and other ideas to practice speech and language skills on your next car ride, continue reading! The main thing that my parents did in the car with me on the way to our cottage was to use flash cards. One parent would be driving and the other parent would drill us on flash cards for math facts or language skills. A favorite product of theirs was Brain Quest. These booklets of educational trivia were always a big hit and in the pockets behind my parents' seats. A couple of games that my brother and I liked to play on car rides included I Spy, looking for license plates from as many states as we could find, and looked for words on road signs that started with each letter of the alphabet to see who could get to Z the fastest. I Spy is a great game for describing objects and categorization. The road sign game is great for letter recognition and you can tweak it for children who are working on speech sounds! Have your child search for as many words/cities that start with his or her speech sound on various signs as you drive! Another great activity that many families play in the car is having a scavenger hunt. Many stores have pre-created scavenger hunt pages for car trips. Create your own scavenger hunt activity by placing different objects/signs/stores you may find along your trip related to your child's speech and language goals! If your student is working on categorization skills, have them find as many signs or bumper stickers containing objects in a certain category. If a student is working on a specific speech sound, have them find as many items with his or her sound! Car rides were also not without clipboards. My parents usually kept a couple on hand so that we could do worksheets in the car. If your child does not get car sick, you should give this a try! Writing may be difficult because roads can be bumpy, but circling or coloring in answers on a worksheet can work great! You can find some great speech and language worksheets to use on Super Duper's Facebook page daily! If you are a music lover like my family (or Goofy in "A Goofy Movie"), it is never silent in your car. My family was always singing tunes on the way to my Grandparents for Christmas as well as on summer vacations. 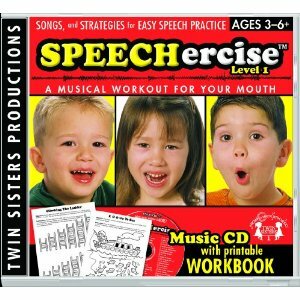 I found two CDs (and own one of the two) online that have a focus on speech sounds called "Speechercise"! 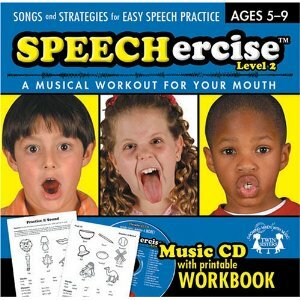 Each song deals with a different speech sound and the CDs also contain worksheets. Sequence the events/errands in order of where you are going first, second, etc. Have children plot out errands/directions on a map. List parts of a car, describe cars, or name different types of cars. Look at clouds out the window and describe what they look like. Start a story and have each person in the car add on to it. Before I end this entry, I want to state that it is important to discuss long car rides with students on the autism spectrum prior to leaving. Talk about where you are going, show images of where you are going, show your child where you are going on a map, tell them how many days you will be gone and when you will be back home, talk about what to pack and the weather, discuss various events that may happen, and talk about what they can do during the long car ride. This will help prevent anxiety on the trip! 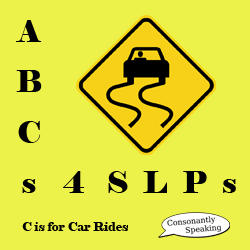 Pack some fun and practice speech/language skills during your next car ride!